The US dollar was down against the euro and the British pound and flat against the yen today despite some better economic news. New jobless claims were reported at 266,000 this week – beating the forecast of 274,000 by 11,000. A strong reading and well below the 300,000 which is considered the threshold for a healthy labor market. Claims have been consistently below this level for six month. Continuing jobless edged higher at 2.2M but came in below analysts’ estimates. Thursday was a busy data for analysts with the European Central Bank, the Bank of England and the Federal Reserve all in the spotlight. The Bank of England’s committee voted 8-1 to keep monetary policy and its asset purchase facility unchanged. The inflationary outlook was more dovish than expected and this caused some weakness in sterling. Likewise the ECB reiterated its stance that the risks to inflation are firmly on the downside. They also saw the outlook for the Eurozone economies as more challenging following events in China and emerging economies. The FOMC minutes also cast some more light on the deliberations that took place during the Fed’s last meeting. The euro took a hit early in the session after some disappointing trade figures from Germany. Exports were down 5.2 percent in August which was well below the median forecasts which were for a fall of 1.2 percent. The latest data intensified concerns that the slowdown in China is having a real impact on demand across Germany’s key export sectors, and prominently the car industry. EUR/USD fell to the bottom of the range at 1.1242 before finding support and staging a late rally. Sight of the minutes from the Federal Reserve’s last meeting provided a push lower as buying interest fell. 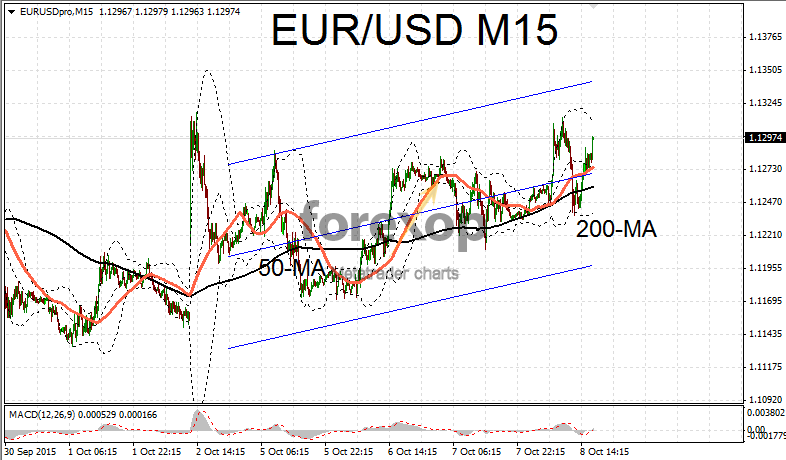 EUR/USD was testing resistance at 1.13. 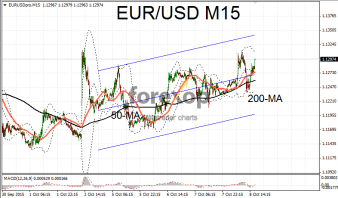 On the hourly and lower charts the pair is trending within a choppy though upwards channel. A full break above 1.1313 will denote an upwards extension of this rally. With the apparent exhaustion in the dollar’s bull-run this seems a distinct possibility.